Joyce Carol Oates and John Updike are just two of the many speakers the English Department has helped bring to the campus. If you want to talk to the best minds in literature, the English Department is a great starting place. Check out who else we've brought to campus..
Want to see England the way Jane Austin saw it? You can -- if you are awarded one of the dozen or so fellowships that Mr. Charles F.Green III provides. Details are here. Your first step to getting a Wentworth is to figure out what author or literary figure you'd like to follow. And then fill out the form, whose link is on this page. 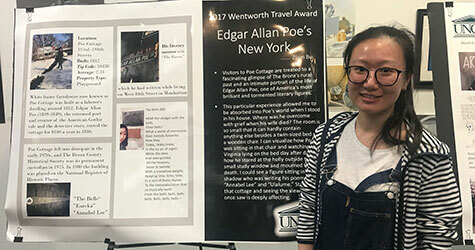 Many of our Wentworth Fellows show their final poster projects at the twice-a-year English in Action Showcase. Check them out here.